1. PREPARING FOR BLOOD SAMPLE. Open the individually-wrapped test device and prepare the lancet. Then wash your hands thoroughly with soap and warm water. Rinse and dry your hands completely before beginning the test. Select your middle or your ring finger. To increase blood flow, let the arm of the selected finger hang down at your side for at least 30 seconds. If you are right-handed, draw blood from your left hand. (Reverse if left-handed.) Fasting is not required, but in order to compare results between tests it is wise to take the test at the same time each day, like just before breakfast. 2. DRAWING BLOOD SAMPLE. Lay the selected hand, palm up, tight against a flat table surface. Don't let your finger move away during this procedure or you may not get enough blood. Push the orange stem into the body of the lancet until it clicks. This loads the spring. Twist off the orange stem. This exposes the needle inside the device. Place the large opening TIGHT against the side tip of your finger and press the firing pad. Using the side avoids any calluses that may be present on the finger. You may feel a slight sting. Blood may not appear until you squeeze your finger. The above lancet has a gray body. It can be reused by pushing the stem into the body and relatching the trigger. However, the same lancet should not be used on different people. A second type of lancet, with an orange body, is slightly different. This type of lancet can only be used once. It will not relatch. Note: The lancets shown above are typical of those normally supplied. However, the lancet that comes with your kit may be different and have different instructions. 3. ADDING BLOOD TO THE WELL. You must add enough blood within 5 minutes of pricking your finger to cover the black Fill Circle. Point your finger down directly over the Blood Well and squeeze your finger from its base to the puncture several times. Squeeze and release your finger a few times to form a hanging drop of blood. Let the drop of blood touch the bottom of the well. Continue adding blood until the black Fill Circle disappears. For best results, add blood as quickly as possible. Don't worry about adding too much blood. Once the circle is covered, wait at least 2 but no more than 4 minutes. Then begin step 4. While waiting, hold a piece of gauze or clean tissue to your finger, or apply an adhesive bandage. 4. ACTIVATING THE TESTER. After waiting, hold the test device firmly in your hand. Pull the clear plastic tab on the right side of the device until you can see the entire arrow. Then TAP THE TEST DEVICE ON THE SURFACE OF THE TABLE A COUPLE OF TIMES. FAILURE TO DO THIS MAY RESULT IN A LOW READING. The "OK" indicator at the bottom turns purple in about 5 minutes. The "END" indicator at the top turns green in about 10-12 minutes. 5. READING THE RESULT. Read the test result under a bright light after both indicators change color. Find the very tip of the purple color bar in the Measurement Scale, even if fuzzy or faint. 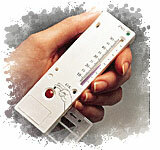 This number is your "test device reading", not your cholesterol level. Using the Cholesterol Result Chart, match the number of the column labeled "test device reading" with the number to its right under the column labeled "cholesterol mg/dl". This is your cholesterol level expressed in milligrams per deciliter. 6. ADDITIONAL HELP. Some people have difficulty getting enough blood to fill the well. Sometimes it helps to put the hand in warm water first. Try swinging the arm in a circle so centrifugal force puts more blood in the fingers. Then wrap a rubber band around the base of the finger. Be sure to lay the finger on a hard surface so it cannot be drawn away when the lancet is used. Use alternating pressure from both thumbs to "milk" the blood out. Try letting your arm hang down straight at your side while squeezing the finger until a drop starts to form. 7. TECHNICAL INFORMATION. The device is a hand-held cassette comprised of three plastic parts: a cover, a moveable tab, and a base. The cover houses the measurement scale, the blood application well and two windows through wich a color change is noted to signal that the reagents are functioning properly, and that the assay has reached completion. The moveable tab and base operate in synergy to facilitate a sequence of actions and chemcial reactions within a series of paper strips. In brief, plasma from the blood sample comes in contact iwth a buffered protein solution containing horseradish peroxidase (HRP). Cholesterol within the sample is converted to hydrogen peroxide by two enzymes (choesterol esterase, and choleseterol oxidase) immobilized on the chromatography paper. The hydrogen peroxide makes contact with a uniformmly coated dye in a distal region of the cassette (the Measurement Scale), and the hydrogen peroxide and the dye react with the HRP to form a purple color peak. Once the chemical reactions begin, a color change is visible at the proximal end of the paper strip (the first window) to alert the clinician that the device is functioning properly. When the entire solution has reached the top of the Measurement Scale, an indicator produces a green color (seen through the second window) to signal that the assay is complete. The height of the color peak is proportional to the amount of hydrogen peroxide, and thus the concentration of cholesterolwithin the sample. The height (in millimeters) is converted to cholesterol (in mg/dL) via the use of a conversion chart that accompanies each test.